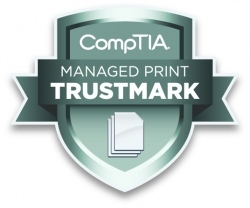 Sofia, Bulgaria/ February, 06, 2017 – Cantek EOOD announced today it has received the CompTIA Managed Print Trustmark™, a respected industry credential that signifies its adherence to best practices for technology service delivery and customer interaction. “Earning this credential identifies Cantek EOOD as a business that meets or exceeds the best business practices the IT industry has to offer,” said Nancy Hammervik, senior vice president, industry relations, CompTIA. To earn the CompTIA Managed Print Trustmark, Cantek EOOD was evaluated on the internal practices and procedures they use to run their business and the external activities and operations they engage in with customers and prospects.